The Silverton 330 Sport Bridge boasts a spacious, full-beam interior with large wrap-around windows and a glass sliding door creating a rich, warm, open concept living space. 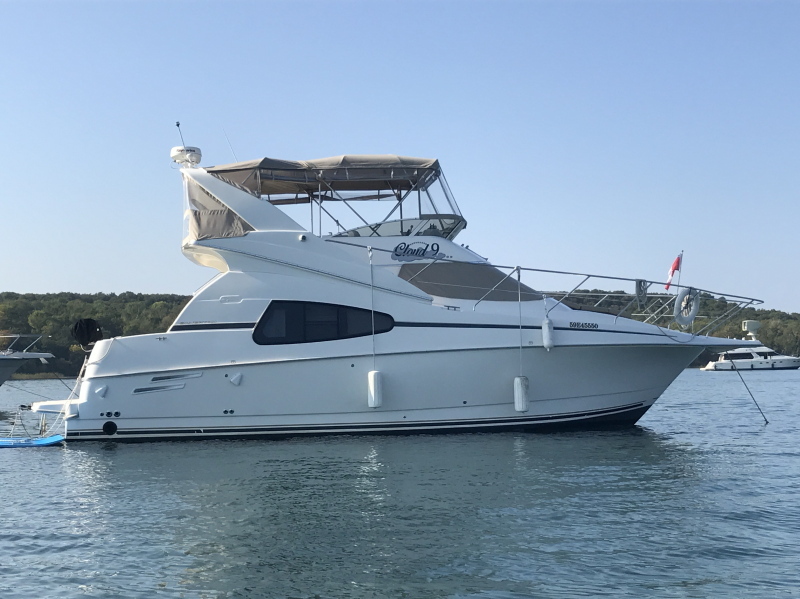 An oversized flybridge allows for a sun pad area aft, a convenient wet bar for entertaining, and passenger seating for six or seven adults around the helm. This freshwater 330 Sport Bridge has a custom bridge enclosure with wing-style access doors to "SideWalks" providing safe and easy access to the foredeck area. Below decks, a complete galley with huge counter and loads of storage space make entertaining a breeze. A convertible dinette provides additional sleeping capacity when needed, and there is a private stateroom forward with comfortable queen berth. The salon is beautifully finished with rich cherry wood cabinetry and Ultraleather furnishings with lots of natural lighting. The large aft cockpit has built-in storage and a transom door for easy access to the swim platform. She's equipped with all the essential cruising amenities, plus bow and stern thrusters for precision maneuvering around the dock. Twin Crusader EFI engines provide great reliability and more than ample power for comfortable cruising in all conditions. Cloud 9 has been beautifully maintained and shows extremely well. She is a "must see" for anyone looking for a spacious, mid-size cruiser designed for maximum comfort and great performance.